ആഫ്രിക്ക , ഏഷ്യ , മഡഗാസ്കർ , പസഫിക് ഐലന്റ് മേഖലകളിലെ ഉഷ്ണമേഖലാ പ്രദേശങ്ങളിൽ കോഫീ കുടുംബത്തിൽ റുബിയേസീയിൽ കണ്ടുവരുന്ന പൂച്ചെടികളുടെ ഒരു ജനുസ്സാണ് ഗാർഡെനിയ . Gardenia boninensis (Nakai) Tuyama ex T.Yamaz. Gardenia carinata Wall. ex Roxb. India, Malaya. Gardenia cornuta Hemsl. (Natal gardenia). South Africa. Gardenia fucata R.Br. ex Benth. Gardenia gummifera L.f. India. Small tree, to 3 m high. Gardenia imperialis K.Schum. Tropical Africa. Small tree to 12 m.
Gardenia ixorifolia R.Br. ex Hook.f. Gardenia jasminoides J.Ellis (Common gardenia, Cape jasmine or Cape jessamine). Southern China and Japan. Gardenia latifolia Aiton India. Shrub or tree, 5–10 m high. Gardenia obtusifolia Roxb. ex Hook.f. Gardenia panduriformis Pierre ex Pit. Gardenia pyriformis A.Cunn. ex Benth. Gardenia resiniflua Hiern (Gummy grdenia). South Africa. Gardenia schlechteri Bonati & Petitm. Gardenia taitensis DC. (Tahitian gardenia, Tiare māori). Polynesia. Gardenia ternifolia Schumach. & Thonn. (Large-leaved Transvaal gardenia). Sudano-Zambezian savannas and woodlands. var. goetzei (Stapf & Hutch.) Verdc. 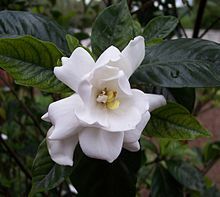 Gardenia thunbergia Thunb. (White gardenia, forest gardenia, or witkatjiepiering) South Africa. Shrub or small tree, 2–5 m high. Gardenia tubifera Wall. ex Roxb. (Golden gardenia). Southeastern Asia. Small tree to 15 m high. Gardenia vitiensis Seem. (Fijian gardenia) Fiji. Gardenia volkensii K.Schum. (Transvaal gardenia or savanna gardenia). Tropical Africa. subsp. spathulifolia (Stapf & Hutch.) Verdc. ↑ "Gardenia". The Plant List. ശേഖരിച്ചത്: 2014-03-06. വിക്കിമീഡിയ കോമൺസിലെ Gardenia എന്ന വർഗ്ഗത്തിൽ ഇതുമായി ബന്ധപ്പെട്ട കൂടുതൽ പ്രമാണങ്ങൾ ലഭ്യമാണ്. ഈ താൾ അവസാനം തിരുത്തപ്പെട്ടത്: 07:21, 24 മാർച്ച് 2019.